Frangipani trees just seem to typify the tropics/subtropics and they are excellent trees to grow here on the Coffs Coast. Mature trees can grow to around 6 m high and 5 m wide, so this needs to be considered when selecting ‘the spot’ when planting. 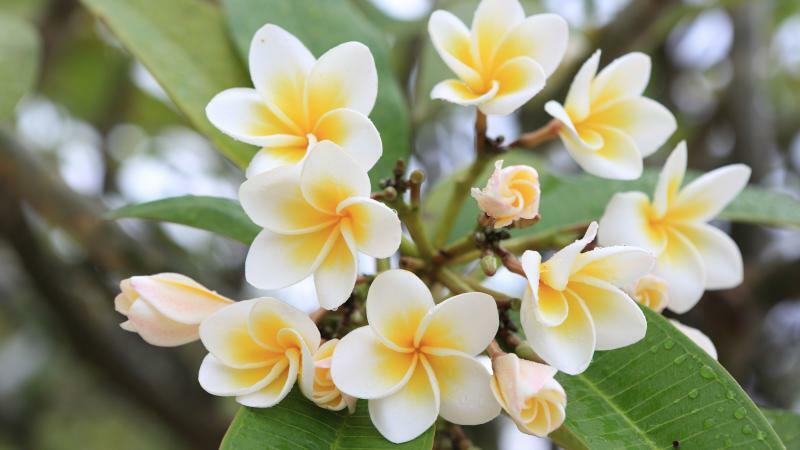 Frangipanis grow slowly – only around 20cm a year, so patience is needed to see this tree reach its full growth. They seem to thrive without a lot of maintenance and the only thing to keep an eye out for is rot. Frangipanis have a small root ball, their non-invasive roots are ideal to plant near walls, retaining walls, pool surrounds etc. They look stunning as a feature tree in sweeping garden beds and offer protection to other more sensitive plants during summer. Or as a free-standing tree where their beautiful umbrella shape can be totally appreciated. Can Frangipanis be grown in containers? Certainly, they flower reliably every summer giving a wonderful splash of colour. Needless to say, the best quality potting mix has to be used. If your potted tree is getting too big for your area, it can be pruned back quite successfully and your pruning pieces can be shared with your friends. To see a post on how to grow Frangipani from cuttings please see this post from May 2016. 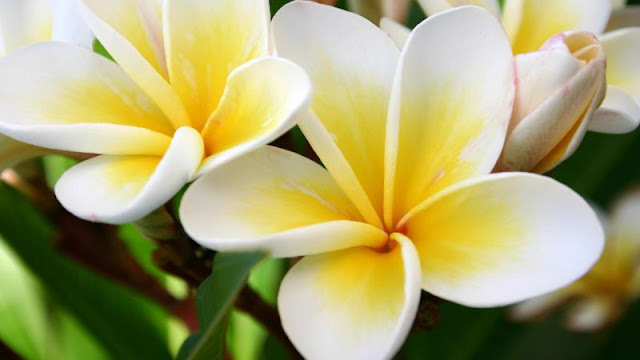 Frangipani seeds are produced in a long, narrow pod, which can contain around 40 or so seeds. Remove the seeds from the pod and carefully tear off the wings. Dampen a sheet of paper towel, lay the seeds on top and dampen another sheet and place over the seeds. Place the paper sheets in a plastic container and store in a dim, warm place for about two weeks (or until the seeds sprout small white roots). Fill small plastic pots with a blend of potting mix and coir fibre using a 50:50 ratio and press the seeds gently into the surface, with the roots pointing down. Dampen the mix with water. After a few weeks, the seeds will sprout their first pair of leaves. Repot into individual pots and allow to continue to grow. When the plants reach 30cm high, repot into a large-sized pot. The classic white flowering Frangipani is the first to flower each season and is a firm favourite for many. Enthusiasts claim that there are up to 300 different flower colours found in Australia alone. From pale pinks to butter lemon to the wonderful vibrant blood red with peach, mango, lipstick pink, even a lilac (which I have yet to see growing). For folk who visit Moonee Beach there is a garden on the corner of Moonee Beach Road and Moonee Creek Road that has quite a few different shades growing atop a retaining wall. With the different colours come different scents like vanilla, coconut, apricot and jasmine fragrances. We have a bi-colour growing in our garden which doesn’t have much of a perfume at all. On the Coffs Coast Frangipanis will flower from December until around April and thrive in well-drained soil, plenty of sun and frost free conditions. In frost-prone areas it is still possible to grow Frangipani if a microclimate can be established for them. Radiating heat from brick paving and walls will help frangipani withstand cooler winters. Or the use of containers can also be employed and these moved to a more sheltered area during winter. They grow very well in the coast’s sandy soils and are perhaps one of the best trees for tolerating salty air. They do struggle in clay soils however, in our garden we prepared the soil quite well before planting and so far they are doing quite well. We are fortunate here in Coffs as our winters are so dry. Sometimes during wet, cool weather Frangipanis can be at risk of root, branch and tip rot, which is caused by a fungus. It is quite simple to discern which plants are affected when you notice that the stems become soft. To check on your plant’s health, squeeze the stems (firm stems indicate a healthy tree). To reduce the risk of rot avoid watering in winter. If you notice the stem becoming wrinkled spray leaves with AntiRot. If you notice spongy stems, remove the stem completely to the junction with a main branch. Thinning out 15 to 20% of the canopy every few years is good practice as it allows more light and air into your tree therefore, reducing stem rot. It is not necessary to feed Frangipani trees however, they will flower bigger and better than ever if you spread some fertiliser around the drip line during the first flush of growth in spring and summer. If you are down south towards the end of February 2017 you can learn more at the Begonia & Frangipani Weekend 25 & 26th February, 226 Annangrove Road Annangrove. It is a gold coin entry and you can peruse displays and stalls and attend expert talks and demonstrations. For further info see this link for details.